LEAD JUDGMENT BY: HARUNA SIMON TSAMMANI, J.C.A. This is an appeal against the Ruling of the Federal High Court of Nigeria, Abeokuta Judicial Division, delivered by Shitu Muhammed Abubakar, J. An order granting leave to the Applicants to serve the originating summons and all other processes meant for service in this suit on the Defendants’ outside Ogun State and in the Federal Capital Territory, Abuja. AN ORDER granting leave to the Plaintiffs/Applicants to serve the originating summons and all other processes meant for service in this suit on the 3rd and 4th Defendants by substituted means to wit by delivering same to an employee not below the rank of secretary in the secretariat of the 2nd Defendant located at WADATA Plaza, Zone, Zone 5, Abuja. An interim order directing the 1st Defendant to accept or process only the list of candidates of the PDP for the 2019 general election in Ogun State authenticated by the plaintiffs as having emerged from primaries conducted by them for the House of Assembly, House of Representatives, Senatorial and Governorship elections and submitted by the Plaintiffs or their authorized nominees pending the hearing and determination of the motion on notice. An order of interim injunction restraining the 1st Defendant by itself, servants, officials, agents or privies from accepting, processing or publishing the name/s of any person/s purporting to be a nominated candidate/s of the PDP from Ogun State for the House of Assembly, House of Representatives, senatorial or governorship election except those who emerge from primary elections constituted by delegates authenticated by the Plaintiffs, convened and conducted by the plaintiffs for the election/nomination of 2nd Defendant’s candidates in Ogun State pending the hearing and determination of the motion on notice. An order of interim injunction restraining the 2nd – 4th Defendants from convening, conducting or organizing a National Convention of the PDP for the nomination of the Presidential candidate of the party without the authentic delegates from Ogun State listed in Schedule A attached to this originating summons (as authenticated and accredited by the Plaintiffs) in attendance and voting pending the hearing and determination of the motion on notice. An order of interim injunction restraining the 1st Defendant by itself, its members, employees, servants, agents or privies from accepting, processing and or publishing (for the purpose of the 2019 general elections) the name of any person purporting to be the nominated presidential candidate of the PDP (notwithstanding that such a name is submitted by the National Executive Committee of the PDP or persons claiming to act for it) when such a person claiming to be the Presidential candidate of the PDP is a product of any National Convention convened, organized and/or conducted by the 2nd to 4th Defendant or persons claiming to act for them, without the authentic delegates from Ogun State including the Applicants herein and others listed in Schedule A attached to the originating summons (as authenticated and accredited by the Plaintiffs) in attendance and voting pending the hearing and determination of the motion on notice. An order of interim injunction restraining the 1st Defendant by itself, its members, employees, servants, agents or privies from accepting, processing and or publishing (for the purpose of the 2019 general elections) the name/s of any person/s purporting to be (a) nominated candidate/s of the PDP from Ogun State or presidential candidate of the PDP (notwithstanding that such nomination is submitted by the National Executive Committee of the PDP or persons claiming to act for it) when such person/s claiming to be candidates of the PDP for the general elections is/are (a) product/s of any unity list or consensus arrangement which bypasses the prescribed electoral process of the PDP, particularly the electoral colleges constituted by delegates including the Ogun State delegates listed in Schedule A attached to this originating summons (as authenticated and accredited by the Plaintiffs) in attendance and voting pending the hearing and determination of the motion on notice. And for such further consequential or ancillary orders as this honourable Court may deem fit to make in the circumstances. When the Ex-parte Motion was heard, the learned trial Judge refused prayers 3 – 8 and ordered that the Appellants be put on Notice. Prayers 1 and 2 on the Ex-parte Motion were however granted.The trial Court ordered that the Originating Summons and all other processes be served by delivering same to an employee not below the rank of secretary in the secretariat of the 1st appellant located at Wadata Plaza, Zone 5, Abuja. In an “affidavit of non-service” deposed to by the bailiff, he could not serve the processes as strictly provided in the ruling. The trial judge nevertheless found that the service was proper. Having thus determined, the Plaintiffs/Respondents moved the Motion on Notice. The trial Judge acceded to the application and granted the reliefs therein except for prayer 4 which was refused and struck out. Unhappy, appellants appealed to the Court of Appeal. “1. Whether from the totality of the facts and law placed before the trial Court, there was service and/or proper service of the Originating Processes and the Interlocutory Application on the 2nd – 4th Defendants now Appellants. Whether the trial Court had the requisite jurisdiction to hear and determine the Interlocutory Application subject matter of this appeal in the manner it did. 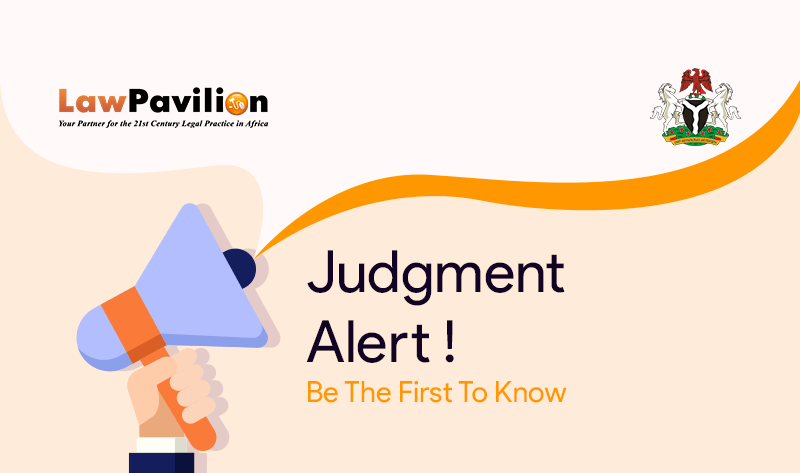 Whether the Appellants were given fair hearing before the determination of the Motion on Notice dated the 25th September, 2018 filed by the Plaintiffs now 1st – 9th Respondents to warrant the trial Court making such grievous orders it made (which orders affected the Appellants). In conclusion, the appeal was allowed. The ruling of the trial Court was set aside. The case was remitted to the Chief Judge of the Federal High Court to be assigned to another Judge.